Mirror, mirror on the wall, who is the scariest slasher of them all? Is it Jason, Freddy, Michael Myers or is it just a simple mirror that can create more shivers down your spine than any of these pretenders? Oculus introduces a killer so sinister and unpredictable, it might even rival death’s own devilish trickery in the Final Destination films. Oculus is the story of brother and sister Tim and Kaylie Russell, each played by two different actors in separate time periods 11 years apart. Older Tim (Brenton Thwaites) has just been released from a mental institution after his psychiatrist is finally convinced that he has accepted responsibility for murdering his parents 11 years previously. His sister Kaylie (Karen Gillan) immediately meets him on release and reveals that she has managed to get hold of the mirror which they both blamed for actually murdering their parents all those years ago. While Tim has moved on, Kaylie is determined that they keep their childhood promise to each other to destroy the mirror and whatever malevolent entity resides in it. Now they have only a few days to kill the mirror and the stage is set not only for scares but also an interesting family dynamic as Tim and Kaylie argue over what exactly happened on the night their parents died. All the while, there are flashbacks that piece together the details of just what did happen, revealing that Tim was not crazy and Kaylie’s determination to rid the world of this mirror is essential. After a few false starts and unnecessary ‘boo... behind you’ scares, Oculus really gets spooky when Tim and Kaylie lock themselves up alone in a room with the mirror. 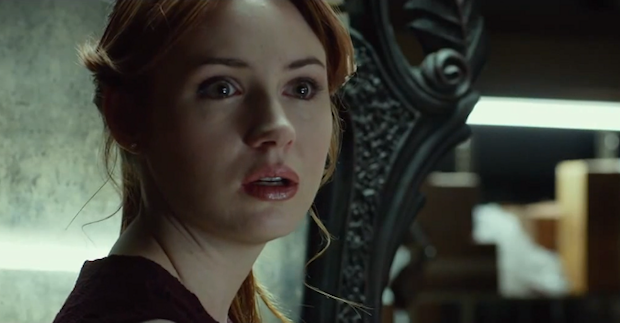 Karen Gillan has an irresistible glint in her eye as she delivers what could have been boring exposition about the history of the mirror and relays her precautions to Tim about how to keep them both alive in the presence of the mirror. It is an ingenious set up and with 45 deaths over four centuries attributed to the Lasser Glass mirror, even the cameras, thermostats, regular phone calls from fiancées and supplies such as water and an inventive way to destroy the mirror may not be enough. The fun brother and sister dynamic is enlivened by the sceptic vs. believer positions of the pair and the flashbacks get creepier and creepier as the film continues. The parents of Tim and Kaylie in the flashbacks get to be most distressing with Rory Cochrane on particularly sinister form as the father of the house. There is some very nasty business with a fingernail and then a light bulb but mostly Oculus goes for slowburn over gore and nasty shocks. As hallucinations start to heat up, there are some genuinely chilling moments and the flashing back and forth in time keeps the pace up as things move towards a somewhat inevitable climax. While there is a suitably bleak ending, it is not a wholly satisfying ending but as with all horrors, there is scope for a sequel, even if much of the invention of this first effort will be lost. Oculus has a smart narrative and excellent performance from a strong female in the lead. While its mirror based story may not be the fairest of them all, it is still far from the exact mirror image of a million other horror movies. Give it a look. Oculus is released in UK cinemas on Friday 13th June.